Jubilee Cottage is an excellent cottage destination in the Suffolk town of Snape. Part of a Victorian building - with the other part of the building being the residence of Jubilee Cottage's owners. Jubilee Cottage sleeps 5 people in 3 bedrooms, and is ideal to explore the area around this beautiful part of Suffolk. Jubilee Cottage also boasts an open fire; this is very handy indeed for those winter breaks. After exploring the Suffolk countryside, you can't beat putting your feet up in front of a real fire. During your stay at Jubilee Cottage, you can also use the owners tennis court! There are three pubs within walking distance of Jubilee Cottage - with all three pubs serving food too. Having a pub or two so close to your holiday cottage makes popping out for a drink very easy indeed; and you've got to try Suffolk's most famous beer, Adnams, which is made just up the road in Southwold. The Suffolk Heritage Coast is very easily accessed from Jubilee Cottage, with Aldeburgh being just a few minutes drive. Or pop to Framlingham to take in the castle. 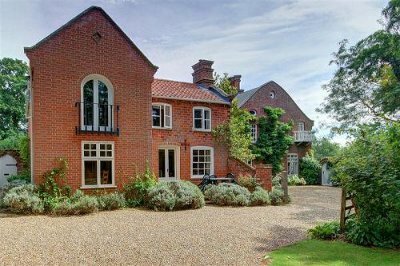 Snape itself is situated in the very heart of the Suffolk countryside, but is also fairly close to the A12 - meaning that driving to Jubilee Cottage shouldn't be too much of a chore. If you're after a cottage holiday in the very heart of Suffolk's lovely countryside, it is certainly worth having a closer look at what Jubilee Cottage can offer you.